Steve has spent his entire life in the service of others. From working his local paper route as a boy, to joining the Ohio Army National Guard and continuing to serve 30 years later. Steve is committed to working towards on nation's future. With your help, we can restore the American dream and make the future brighter for our children. • I affirm that I am making this contribution via my personal credit or debit card for which I have a legal obligation to pay, and not through a corporate or business entity card or the card of another person. • My contribution is made from personal funds, and not from the general treasury funds of a corporation, organization or national bank. • I have not received any funds from another person or entity for the purposes of making this contribution. • I am a United States citizen, or a Green Card Holder who has been lawfully admitted for permanent residence and this contribution will not be reimbursed by another person. Contribution limit: $2,700 for the primary election and another $2,700 for the general election, for a total of $5,400 per person. A couple may contribute up to $5,400 for the primary and up to $5,400 for the general election on a joint bank account check. Contributions by federal contractors, national banks, corporations, and foreign nationals who are not 'green card' holders are prohibited. By providing your phone number, you are consenting to receive calls and texts, including autodialed and automated calls and texts, to that number from Stivers for Congress. 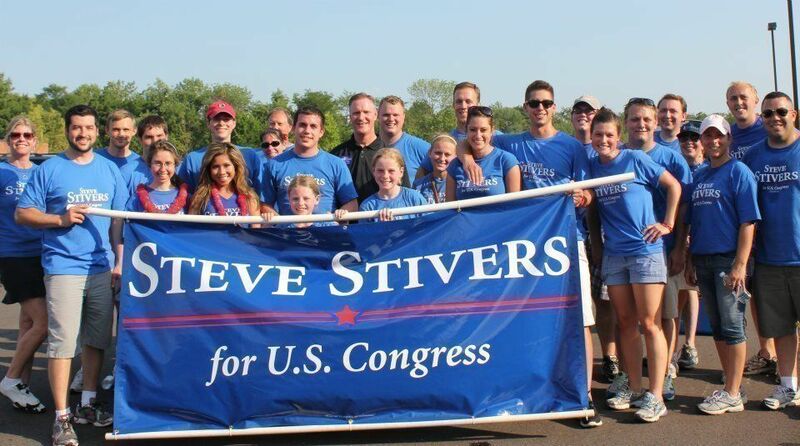 To send a check by mail, please make your check out to Steve Stivers for Congress, 211 S. 5th Street Columbus, OH 43215 By providing your phone number, you are consenting to receive calls and texts, including autodialed and automated calls and texts, to that number from Steve Stivers for Congress. Paid for by Stivers for Congress.